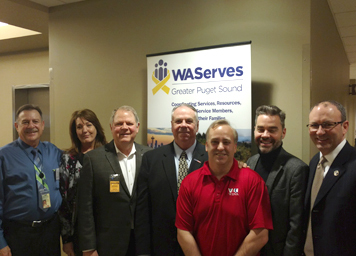 Below are members of the WAServes team who help serve the veterans, service members and their families of the Greater Puget Sound area in Washington. Ray is a US Army Veteran with four years of service. He started working at V.I.E.W (Veterans Independent Enterprises of Washington) in 1994 and eventually became Executive Director. V.I.E.W. was a Work Therapy program that served Washington State homeless veterans. Ray started working for the Washington State Department of Veteran Affairs as a Program Manager in 2005. He received a Washington State Govenors Leadership Award. He developed and opened a Veterans Service Center open to the public as well as in Building 9 Program. The Building 9 team has successfully assisted 360+ homeless veterans in breaking the cycle of homelessness. Andrea worked for Veterans of Foreign Wars/WDVA as an Accredited Service Officer where she conducted interviews with veterans and their dependents. She had to review data on current medical and financial history to obtain information needed to determine eligibility for Federal/State veteran’s benefits. She began working as a Program Specialist for the Washington State Department of Veterans Affairs in 2013. Andrea provides organization-wide program management to include client services, fiscal, administration, and program policy by overseeing and directly all program activities. Mike Schindler, US Navy veteran, is a recognized expert on veteran issues, government processes, and leadership development. Known as a “strategic visionary,” Mike has over 20 years of hands-on/boots-on-ground project management, coaching, and executive experience working in and with the military, start-ups, federal and state agencies, non-profits, universities, and Fortune 500 companies. Mike’s passion is to train and equip leaders in a way that will improve morale and profits. Mike is the Founder and CEO of Operation Military Family Cares – a veteran services and consulting 501c3 not-for-profit that focuses on providing pathways to success for our military and veteran families as well as on improving Department of Defense transition processes. WestCare Foundation is proud to serve as the West Coast's first America Serves Coordination Center to better serve and equip Washington State's active duty, veterans and their families in an 8 county region. WestCare Foundation is proudly celebrating its fourth decade of providing a wide spectrum of health and human services and employing evidenced-based best practices in therapeutic environments. Its continuum of services include substance abuse and addiction treatment, homeless and family services, domestic violence treatment and prevention, mental health and employment programs. WestCare has over 125 programs, and a staff of 1,300 qualified professionals, operating from nearly 100 facility locations in 21 U.S. states and territories. Uplifting the human spirit is the WestCare mission.